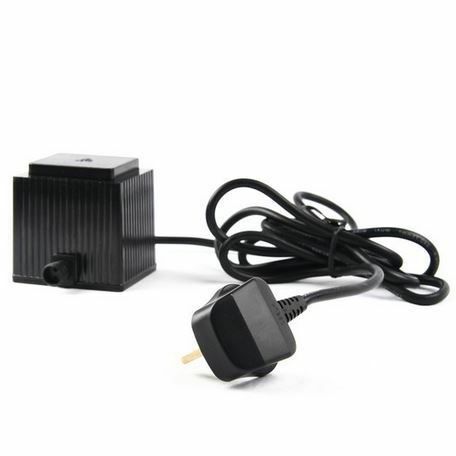 The 6 watt weatherproof transformer is supplied with 2 metres of 230V AC cable and UK Plug, for simple connection to the mains electrical supply. 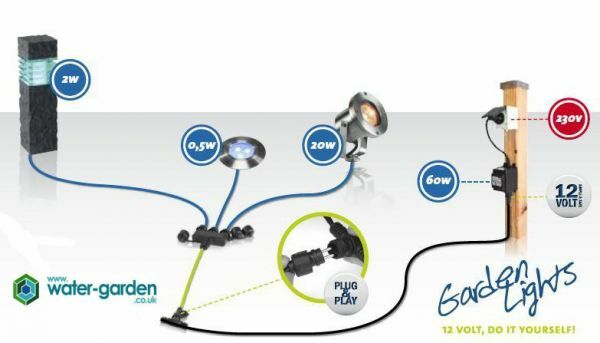 The 6 watt transformer will convert to safe low voltage (12V) electrical supply, ready for connection to the LED Garden Lighting Systems range of low voltage LED Garden Lights (up to 6 watts of lighting maximum), Connection Cables, Splitters, Remote Controller and Timer components. 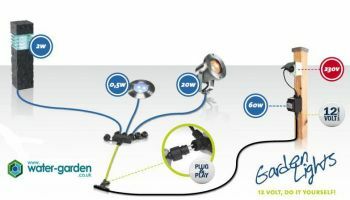 Ideal for use with the Bena, Doba, Mika and Lunaqua Terra Deck Lights or for use when only one or two Plug & Play lights are required. 500mA / 12V AC / 6 watts max. It's shocking how perfect these are for converting one voltage to another, they do this very well. The guys at Water Garden are always super helpful and can offer really great advice. Great service from Water Garden UK! Quick, polite and really helpful.